On 23 & 24 March a reflection meeting took place on the issue of oil exploration and exploitation in Block 5 in the Albertin Rift by SOCO. The workshop took place in Vitshumbi, Ruthsuru, North Kivu. 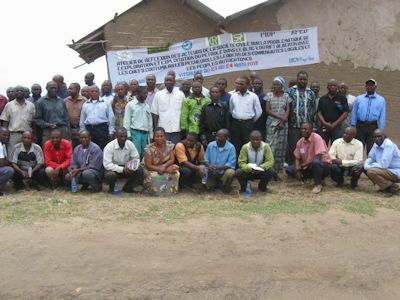 The workshop was attended by local communities who live in and outside Virunga National Park, in the area of Block 5, as well as by local authorities and by CSO’s who fight to protect the environment and local human rights. Nine NGOs took part in this workshop: IDPE, PIDP, SOPR, COPEILE, AFED, CREDDHO, Réseau CREF, ADEF (Bas-Congo Province) and DRCNDF. Local communities were represented by fishing committees who are fishing on Lake Edward, and by people who’s livelihoods are depending on the local natural resources that are found in Block 5. The authorities were represented by the Admin Chef de Vitshumbi, and several local chefs (autorités coutumieres). Civil society was represented by religious leaders, women, intellectuals and other community leadership who have an interest in the issue. Regarding the contract signed by SOCO with the DRC Government, the local communities oppose to ANY oil development (exploration and exploitation) in Virunga National Park. Activities of SOCO are welcomed outside the Park if national and international environmental laws and regulations are respected and if all stakeholders (including local communities) can participate in and benefit from these oil activities. The communities are aware of the consequences of natural resource exploitation. They are at the basis of the fragile government and current conflicts in the eastern DRC. Therefore they want the DRC Government to take its responsibility serious. – Kinshasa Declaration to protect DRC World Heritage sites (14 January 2011). – Inform the local community on the content of the contract. – Assist and support the Congolese civil society in their lobby and advocacy work toaddress the oil exploration issues in the DRC. – Establish/promote synergy between all actors who work on the problems related to oil development. – Defend national and international agreed upon Human Rights law. ← Le Congo autorise l’exploration pétrolière aux Virunga !